What Christmas means to us . . .
click on each photo to put a face to a name ! My grandma would make 100 mince pies and 100 lemon curd and jam tarts every year at this time, before giving the house a thorough bottoming! Here the toaster has just exploded and I already have hurricane hair. Soon though, every room will be full, every bed occupied, and like most of us, shutting myself away to write won’t be an option. I’m bound to be inspired enough by chat and conversation though, to keep scribbling notes on scraps of paper. (Must remember to keep them safe – not risk finding one stuck to the bottom of a Piccalilli jar in February, like last year.) One son recently met a person who studied photography as I did, in the ‘60s, then worked for BBC (and on Evita) as a make-up artist in ‘70s and ‘80s. Great background for my novel, so there’ll be some surreptitious scribbling about that! I love Christmas, always have. Luckily we live in a village with a church and a pub so we make the most of it. And with two cocker spaniels, there’s always a great excuse to trudge off excesses across fields, rewarding ourselves with a nice glass of mulled wine and mince pies in front of a roaring log fire. I do all of it! We’re going to visit family in Dublin too, which will be really special, the lights in the city are fabulous and we’ll head to the coast and then into the mountains for lunch, wonderful. I’m completing the edits of my new novel Scandal of the Seahorse Hotel currently which will take me through to New Year, when we will be in sunny South Devon. I always start a new novel, fresh notebook, coloured pens at the ready while I’m there. The walks on the beach, steaming seafood chowder and local cider help get the brain cells working again – it’s all rather inspirational, so Christmas and New Year is a time of thanksgiving for me, I know how lucky we are. Mags is working on her third novel which features ‘heroine in jeopardy’ as its central theme. She will be spending Christmas at the beck and call of her cat, Tina – no change there – who deserves to have a novel written just about her. I’m dreaming about hitting the road in 2016 with our caravan, computer, parrot and husband to research number four. Highlands of Scotland, here I come. For me, Christmas is all about being with friends and family and taking time to do those things which the madness of modern life seems to push to the back of the queue – loving, laughter and sharing experiences. I’m very enthused about #4 which I’m currently writing and which features a wayward laird who is at odds with his son, an eccentric family of cousins and a missing ‘treasure.’ Hopefully you’ll be able to download it by the end of 2016. It simply remains for us to thank you all for your continued support – whether it be downloading our novels, reviewing them, subscribing to newsletters or just chatting to us on Facebook. Have a great Christmas and a healthy and happy New Year. Soon the shortest day will have passed and we will start journeying towards the light. Here are the links to our amazon pages if you would like to download one of our novels . . . In a trail blazing moment the New Romantics 4 hosted a literary lunch at The Belmont Hotel, Leicester. (See the poster on our EVENTS page) Adrienne secured the gig through a long-standing business connection and co-presented it with Lizzie. The event was part of Leicester’s 2013 Book Fest and fitted in well with the NR4’s aims to bring their books to the attention of a wider audience. The majority of the twenty-three ladies who attended the lunch were businesswomen – although one brave gentleman (Rodney!) and a fellow writer (Lilian) bought a ticket, too. Fortunately, Adrienne and Lizzie are no strangers to public speaking – so, the event held no terrors for them. Adrienne regularly gives talks to business leaders as part of her role as a MD and PR consultant; and after 34 years in education Lizzie declared that the audience was better behaved than the 350 primary children she regularly ‘entertained’ during school assembly. The lunch consisted of a complementary drink and three courses followed by coffee – and the time simply whizzed by. The first talk was down to Adrienne and she described her reasons for becoming a writer. When it was Lizzie’s turn, she simply pointed to Adrienne and declared: “What she said!” – much to the amusement of the lunch guests. Between courses, Adrienne and Lizzie gave brief précis of their novels and then read an extract. This was followed by a question and answer session after a delicious dessert. how closely the heroines mirrored THEM ! To round off a very pleasant lunch, Lizzie and Adrienne read a further extract for their novels, posed questions and awarded a prize to the winning entries. There was a quick signing session of the guests’ complimentary copies of Tall, Dark and Kilted and The Hollow Heart (cleverly included in the cost of the luncheon) and then the hard working executives returned to their businesses. During a short de-briefing session, the literary lunch was pronounced a great success and it is hoped that June and Mags will host a similar event lunch sometime this autumn when the New Romantics 4 publish their second novels. The Bookstop Cafe, Steep Hill, Lincoln. To paraphrase President Obama, if you can’t get in through the front door, go round the back. If you can’t get in through the back – climb over the wall. This ideal has driven the New Romantics 4 forward in their quest to become published authors. And as a result, their novels became available on Amazon as kindle download and paperbacks last autumn. They took this ideal a step further on Saturday 4th May when June and Lizzie drove over to Lincoln for the grand opening of Joff Gainey and Becky Lindley’s Bookstop Café, 47b Steep Hill, Lincoln. An indie author himself, Joff has opened the BookStop Café to provide an environment where book lovers can browse the wonderful selection of books written by indie authors and rest awhile, drink coffee and eat home made cake. Hopefully they will feel moved to purchase one of the excellent indie novels on display after reading the ‘shop copy’ as a taster. The grand opening ceremony took place amidst loud cheers and applause, while inside the café a jazz band added to the carnival atmosphere. For the first three hours of the café’s opening, tea, coffee and cake were complimentary and the customers poured in. Whilst writers rubbed shoulders with potential readers, Lizzie and June were happy to stand back and admire copies of Tall, Dark and Kilted, An Englishwoman’s Guide to the Cowboy, The Hollow Heart and Last Bite of the Cherry displayed on the back lit bookshelves next to Joff’s novel Sleeping on a Cloud. To paraphrase Obama again – the front door was barred, we knocked loudly on the back door but nobody answered – so we’ve climbed over the wall and into Joff and Becky’s Bookstop Cafe. Indie authors and proud of it, the New Romantics 4 will be adding new titles to the bookshelves in autumn 2013. Follow the Bookstop Cafe on TWITTER. We all have books we simply can’t bear to part with because, like the old friends they are, they’ve stuck with us through thick and thin. The oldest book in my collection is Clarendon’s History of the Great Rebellion (1858) followed by The Wild Bird – Margaret Stuart Lane, (1933) The Scarlet Pimpernel (1927), The Prisoner of Zenda and its sequel, Rupert of Henzua (1930). 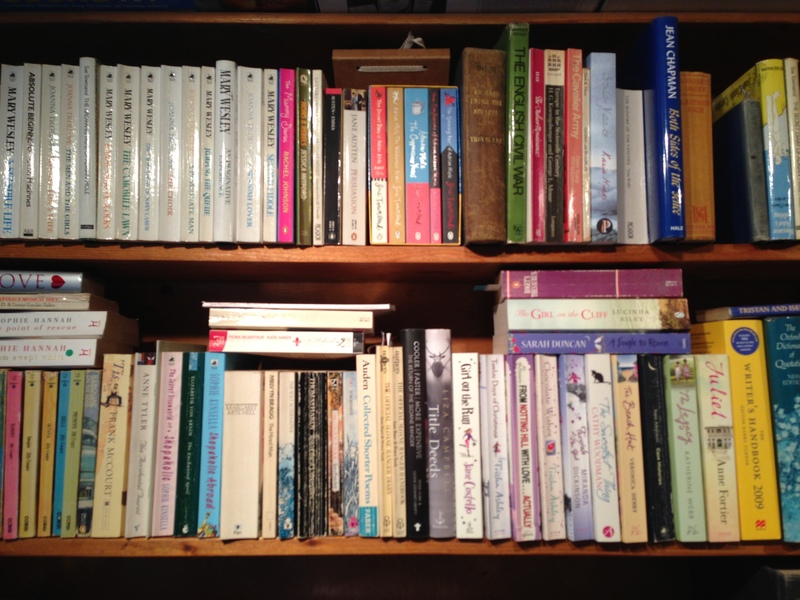 My other ‘keepers’ are the books which saw me through from girlhood to womanhood: Greengage Summer, I Capture the Castle, Bonjour Tristesse and The Dud Avocado. With the fickleness of youth I abandoned these when I discovered Jilly Cooper’s novels (1976). My love of rom coms developing within their pages before coming full circle with Bridget Jones in 1996. I can’t let go any of my penguin classics or historical romances by the likes of Georgette Heyer, Daphne Du Maurier, Jean Plaidy, Margaret Irwin, and Anya Seaton. My particular favourite – Lady of Hay by Barbara Erskine. When I want to remind myself how to write humorously, I re-visit Wodehouse, Terry Pratchet, Tom Sharpe – and the anarchic Catch 22. I also treasure my poetry books . . . John Donne, W.B.Yeats, The War Poets, T.S. Eliot, Dylan Thomas, Ted Hughes and Philip Larkin. And in particular, The Mersey Sound – Adrien Henri, Roger McGough and Brian Patten which reminds me of when I was recovering after an appendectomy in Grantham General (1970). I was reading poems to the other patients in my ward and causing such hilarity that it was confiscated by the ward sister until I was discharged. Honestly . . . I have two comfort reads Tristan and Isuelt by Rosemary Sutcliffe, (so beautifully written) and Hons and Rebels by Jessica Mitford which is great fun. I want to spend the afternoon with the Mitford gels in the Hons Cupboard discussing topics considered unfit for young ladies. So come on, trade – what’s your favourite book? THE ONE YOU’LL NEVER LET GO.